Today I am posting a recipe from Arunachal Pradesh. Everyday this month I will post a recipe from a different state in India. Arunachal Pradesh is one of the northeastern states of India and part of it borders China. It is a naturally beautiful state located mostly in the Himalayas. While I was looking up information on this state I found this travelogue in Mid Day. One sentence caught my attention. "On a particular trip to Arunachal Pradesh, in the small town of Bomdila" the author had momos. 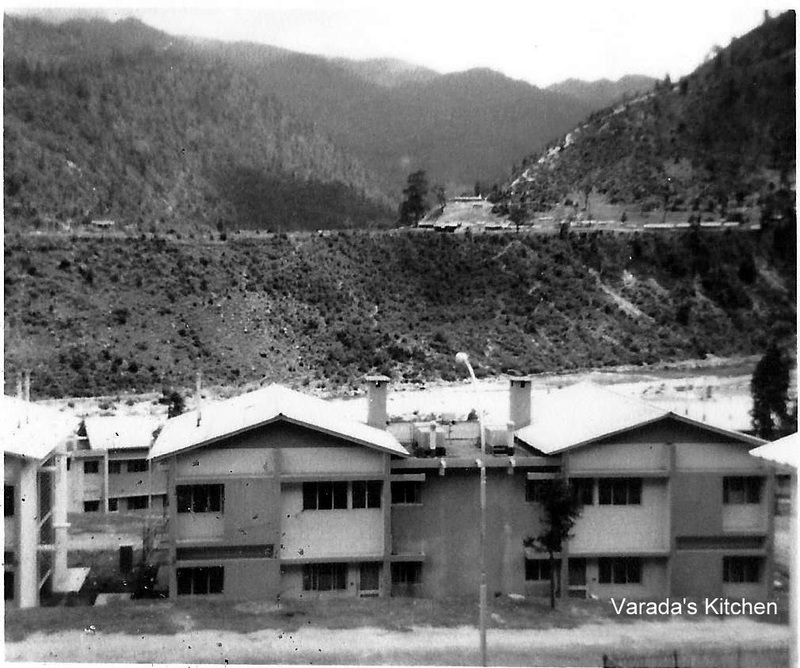 Bomdila: a small town in a valley close to the Chinese border. I have been there as a child of 8 or 9 years. It was a very long and tiring bus ride to get to the town. Today a special permit is needed to visit the area. 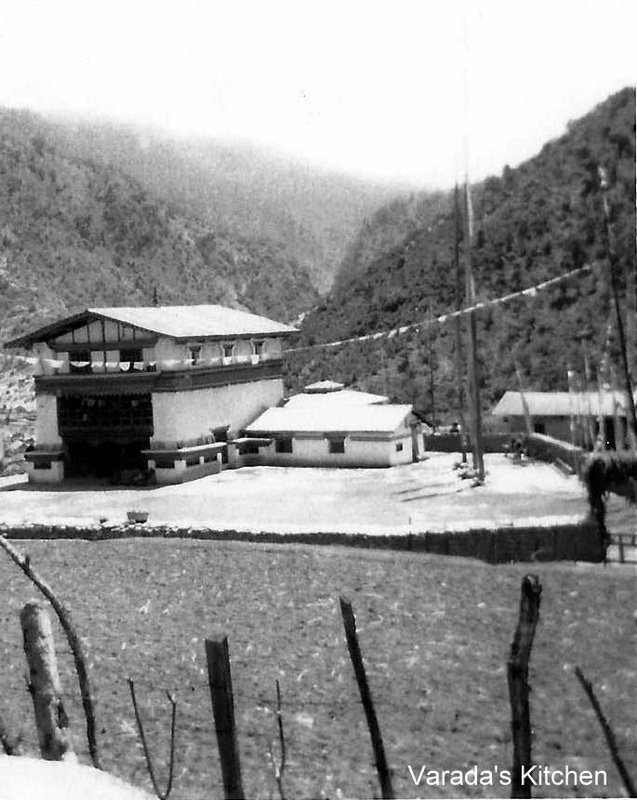 Back then there were no restrictions to visit Arunachal Pradesh. The B&W pictures below are from that trip. I vaguely remember the endless streams, the shaky bridges over them and lots of flags. We were in a very rural area visiting my uncle who was in the Army. We were there for about a week. Everywhere you looked you saw mountains. Growing up in Goa, hilly terrain was not new to me. But this was different, the elevation was much higher than sea level. And the air was crisp and clean. We went for long walks to take in the countryside. I remember a walk in the mountains and everyone getting tired and thirsty. That is when someone local pointed to a stream of water coming straight out of the mountain. True mountain spring water, refreshing, fresh and most importantly, not bottled. After revisiting the fond memories of that trip I decided I wanted to make momos. Momos can be found in all the northeastern states of India. They are believed to have been brought to the region by traders from Tibet. I got this recipe from a bunch of different places so I cannot credit any one site here. The momos were delicious. Heat oil in a pan. Add the onion and cabbage to it. Cook until tender. Add salt to taste and let it cook another minute before turning off the heat. Keep aside. In a mixing bowl mix rice flour and salt with a little water. Knead into a soft ball. Using the olive oil to coat your fingers knead again and keep aside for 15-20 minutes. Put water in the steamer and bring it to a boil. Grease the steamer tray with olive oil. Divide the dough into five small portions. On a working surface, using rice flour roll out one of the portions into a disc. Place the disc in the palm of your hand and work one side of the disc into folds. Place a teaspoon of filling inside. Seal the top to form a lopsided empanada. Place it on a greased streamer tray. Repeat with the other portions of dough. Steam for about 10 minutes on medium high heat. Turn off heat and let the momos rest for a few minutes. Take them out of the steamer and serve. I served them with ketchup and they were delicious. This is my entry for day 2 of BM #39 for the state of Arunachal Pradesh. Check out the Blogging Marathon page for the other Blogging Marathoners doing BM#39. Like the black and white pictures. Enjoying the personal stories that you're sharing for each state. Nice touch.. Momos look great too. V ardha I love those pictures. .they look so serene and breathtaking. I have not travelled on that side of India..but it looks stunning. Oh my very delicious momos with cabbage and onion filling :) I can have them any time , just super tempting :) Love the detailed pictorials :) Thanks for sharing the pics from arunachal pradesh :) I too love mountain spring water .. Very lovely Varada..and the designs on the momo has turned out so well! Those black n white pics are cool man. lovely memories, loved you rice flour momos!!! Super delicious momos with healthy filling!! Very attractive shape, with a beautiful and healthy filling, momos looks attractive. Wow. Your momos are so well made. Great job. They look delicious. Interesting write up, Varada. Healthy momos indeed! what a beautiful site your pictures offered. I have never been to the Northeast regions and would love to travel....Lovely recipe! Lovely momo's..Even I made them for this event,but with maida. I love the fact that you made them with rice flour. Will sure try my hands on them. Wow those are real moments that you want to relive. Love the pictures especially the black n white ones. Love the momos and the folds that u hav edone. So nice of you to share those pics Varadha. Great to see that it is made with rice flour.And the spring bread basket on the side bar is awesome!! love momos...made them some months back! Irresistible moms and love the step by step pictures..
Momos have turned out well and love the simple filling there.